Fancy splashing the cash? How about spinning to win? You can do both with Cash Splash, the very traditional looking, grand pay-out slot machine available in most online casino's today. With a progressive jackpot reaching into the thousands of pounds mark, this old school game comes in both 5 reel, 15 pay line and 3 reel 1 pay line slot machines, and is excellently designed, to give off that Vegas feeling even when you're sitting down in the comfort of your own home. You will immediately recognise the icons or symbols that Cash Splash features upon its reels. They are all very retro and represent the classic slots you would find in any land-based casino worth its salt. The Cash Splash logo, Sevens, Treble Bars, Double and Single Bars, Cherries and Any Bars represent such logos, and a good combination of certain symbols allows you to win big money on Cash Splash. 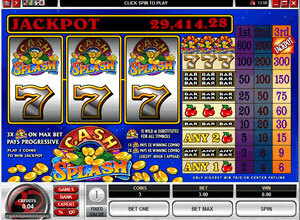 The Cash Splash logo itself acts at the slots Wild card. When you manage to pick up this symbol in your pay line, it becomes a substitute for any other symbol that you may require to complete said pay line. In essence, the Cash Splash logo could mean the difference between winning a jackpot, or ending up, with nothing. There is also a blue scatter symbol that will see whatever your wager was, multiplied by 250 if you have three symbols of more, pushing you into the really big money. Scatter symbols are great, aren't they? As with all progressive jackpots, a small part of your wager is accumulated into the progressive with the gamer picking up the jackpot and becoming the winner if they successfully rack up three Cash Splash symbols with having all of the available pay lines activated. That is if you are playing on the three reel version. Should you be playing on the 5 reel version, you'll need to pull off five Cash Splash symbols and on the fifteenth pay line with all pay lines activated; otherwise you won't be picking up any progressive jackpot! Playing on both versions will only see you set back £3 to wager on all the maximum pay lines. So you've really got nothing to lose do you, it is really up to you whether you think you're luck will be in more on either the three or five reel versions. Of course it is also depends on which online casino you have chosen to play in!